A bicycle with a sticker advertising a Florida punk-folk band recently forced the evacuation of an airport terminal in Memphis, Tennessee. A pilot alerted airport police when he saw a bike with a sticker that read "this bike is a pipe bomb" parked near the passenger ramps of Terminal C at Memphis International Airport, according to the Memphis-Shelby County Airport Authority. 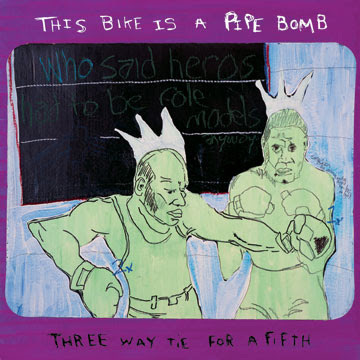 Turns out "this bike is a pipe bomb" is the name of a band from Pensacola, Florida, and this is not the first time its moniker has caused a ruckus -- bikes sporting similar stickers at college campuses in Ohio and Philadelphia led to building closures, arrests and the bikes' destruction by bomb squads. In Memphis, airport police took the owner of the bike into custody but later released him; a spokesman said federal authorities were discussing possible charges, but a federal source said it was "a non-event." A dud, in other words. I think they have more than their name to worry about....i don't see any Emmy's coming this way soon. Um. Okay. I really dont think a person meaning to do harm would actually label the bomb... why are people so dumb?? This band's sticker caused a holy ruckus at OU in Athens a year or so back. The bomb squad came down from Columbus and detonated the poor guy's bike. Linkage soon, if I can find it. Man, aren't we a jumpy society these days? Gotta love the post-911 years.